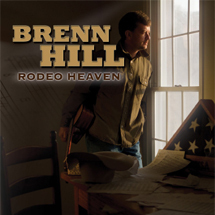 RODEO HEAVEN is the eighth recording for Hill and the sixth under the Red Cliffs Press labeland produced by Brenn and his multi-instrumentalist cohort Ryan Tilby. It features veteran guitarist Rich Dickson and legendary Spokane, Washington bluegrass percussionist Bart Olson. Hill penned fourteen all-new songs for the album which largely commemorates the immortality of one of the world’s most iconic figures-the cowboy. “Live” studio recordings feature Brenn playing and singing surrounded by all-star musicians and capture raw emotion and dynamic energy with no auto-tune or studio tricks in chain.